Jutting majestically out of the turquoise waters of Kailua, the Mokulua Islands provide great views for beginning kayakers. Get a pleasant workout as you draw nearer to the shores of these islands, which are part of a state seabird sanctuary. Arrive at Kailua Beach Center and receive an orientation about your excursion. At the beach, receive paddling and snorkeling instruction. 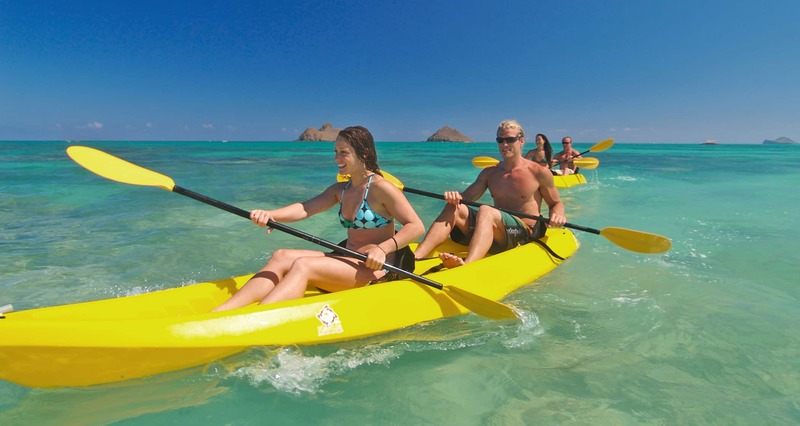 Paddle your kayak to the Mokulua Islands, 2 islets visible from Lanikai Beach. Arrive at the islands, carefully observing the seabird sanctuary and enjoying the scenery. Eat a provided picnic lunch and rest for a while. Paddle back to Kailua beach and return to Kailua Beach Center. No transportation provided check in at Kailua Beach Adventures at 130 Kailua Rd, Kailua, HI 96734. The kayak, snorkeling mask and fin rentals are included in this excursion. Also included is the necessary Hawaii State Department of Land and Natural Resources landing permit. A picnic lunch is included, consisting of cookies, fruit, your choice of a turkey or vegetarian sandwich, and juice or bottled water. This excursion is suitable for kayakers ranging from beginning to experienced. All participants must be able to swim at least 15 yards and weigh less than 250 pounds. Children between 13 and 16 years of age must be accompanied by a parent or legal guardian in a double kayak. Children between 16 and 17 years of age may ride unaccompanied, provided they have a liability release signed by a parent of legal guardian. Guests must bring swimsuits, sunscreen and towels. We encourage Guests to bring a camera. Please bring photo identification for credit card transactions or purchase of alcoholic beverages. Driver's licenses and passports are examples of valid photo identification.